Home > Clinicians > Diagnosis Gallery > Porpyria Cutanea Tarda - Sclerodermoid Variant. Porpyria Cutanea Tarda - Sclerodermoid Variant. The findings in are highly characteristic for porphyria cutanea tarda even though there is no frank bulla formation. 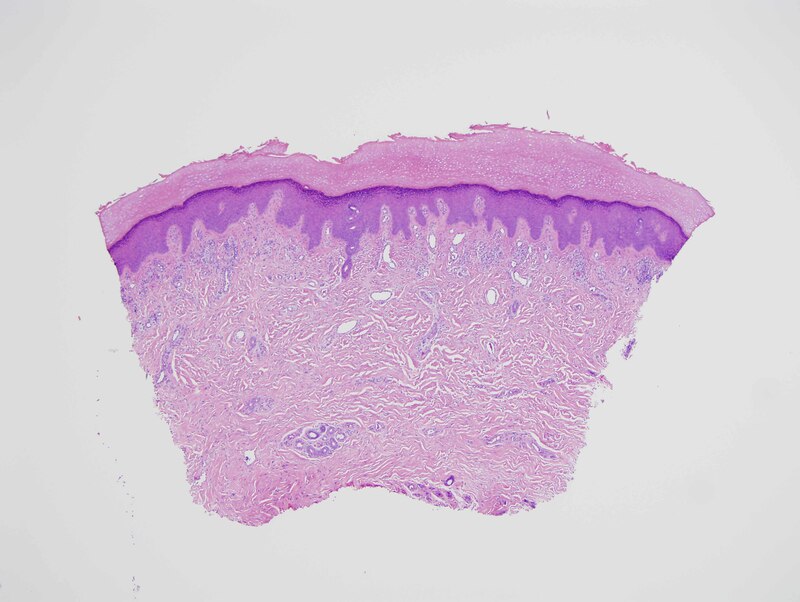 In particular, there are very significant microangiopathic changes involving the capillaries and venules of the superficial dermis characterized by markedly thickened basement membrane zones particularly highlighted on the PAS preparation. 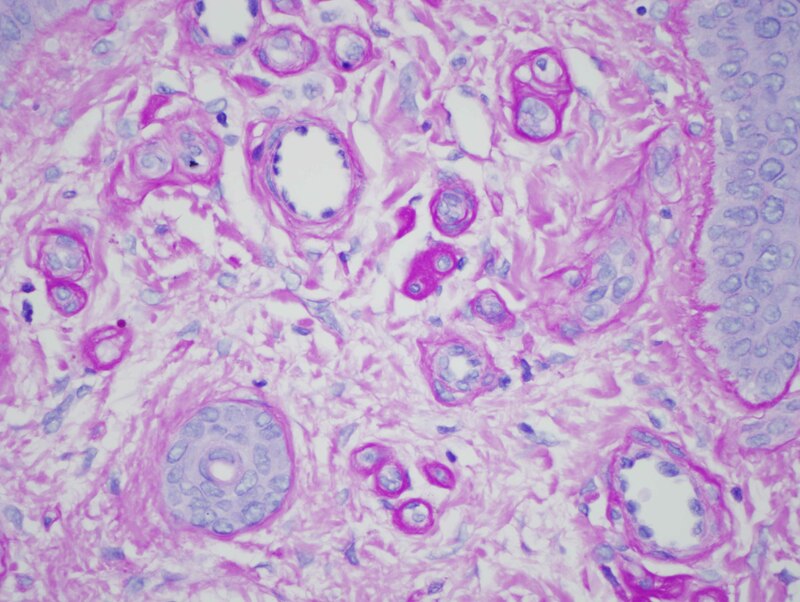 The basis of these microvascular changes reflect antecedent microvascular injury with resultant reparative basement membrane zone reduplication. 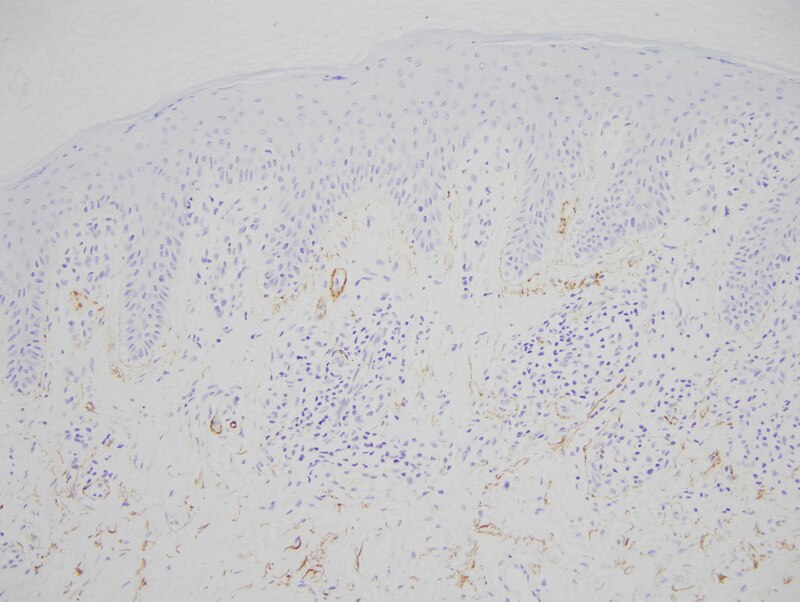 The endothelial cell injury in porphyria cutaneous tarda is one that is complement mediated as characterized in this case by the extensive degree of C5b-9 deposition within the microvasculature. 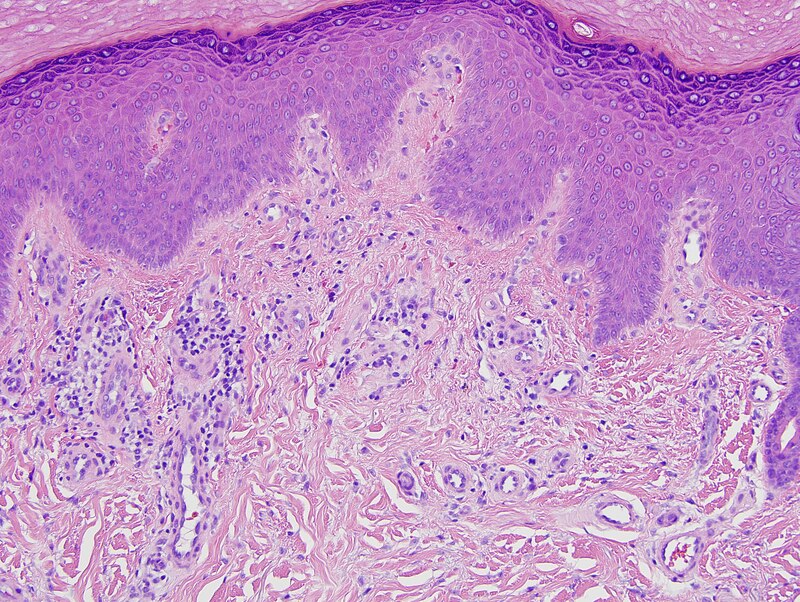 We have postulated in a prior publication that the basis of the vascular C5b-9 deposition and consequent vascular injury reflects the ability of elevated circulating porphyrins coursing through the superficial cutaneous vasculature to activate complement when exposed to sunlight and/or other forms of ultraviolet light exposure. Another fascinating feature in this case is the supervening sclerodermoid change. Overall I do favor sclerodermoid porphyria cutanea tarda. 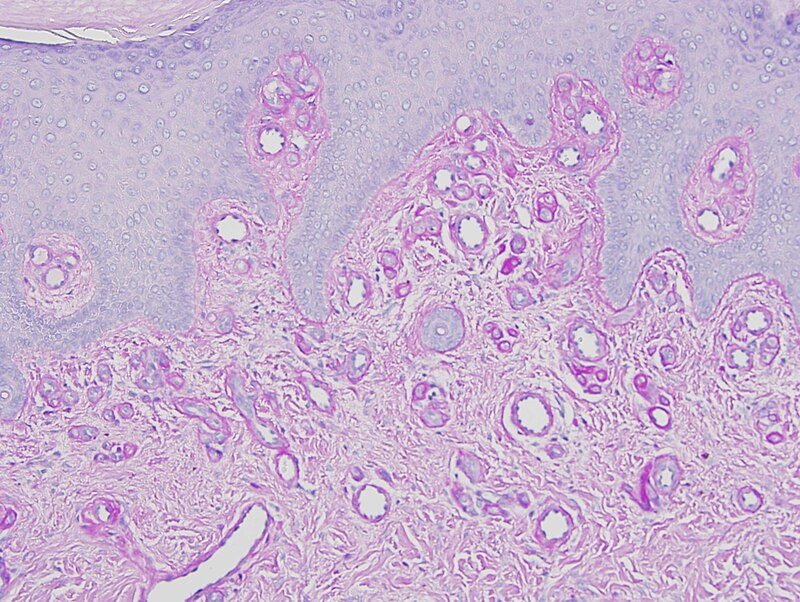 The dermis in fact does appear fibrotic with interstitial hypercellularity. 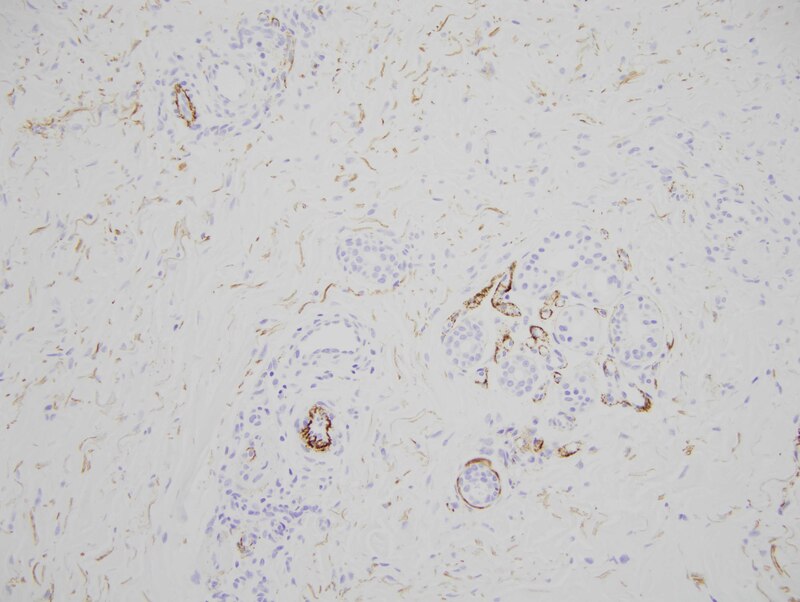 Unlike classic scleroderma/morphea, the CD34 preparation is not diminished, although, there is acquisition of the smooth muscle actin phenotype amidst the interstitial fibrocytes. 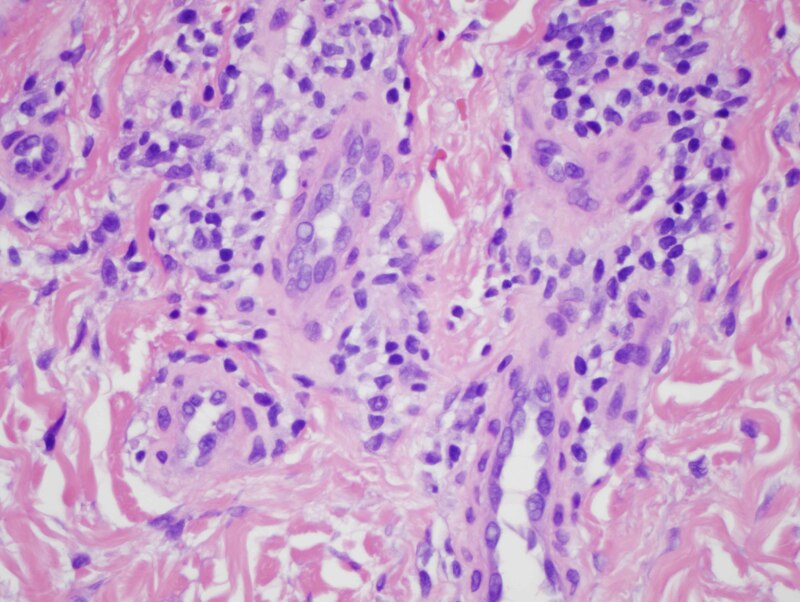 Sclerodermoid porphyria cutanea tarda has primarily been described in porphyria cutanea tarda although there are small case series and anecdotal case reports documented cutaneous sclerosis and erythropoietic protoporphyria, variegate protoporphyria and hepatoerythropoietic porphyria. Most of the patients with sclerodermoid porphyria cutanea tarda initially present with signs and symptoms of porphyria cutanea tarda but there are some patients who present initially with sclerodermatous plaques an average of twelve months before more conventional lesions of porphyria cutanea tarda develop. The sclerodermatous changes are usually involving the areas effected by classic porphyria cutanea tarda but also occur in photo-distributed areas such as the v of the neck. The vast majority of patients with sclerodermoid porphyria cutanea tarda do not have evidence of systemic scleroderma whereby with the progressive reduction of urinary uroporphyrins through treatment there is resolution of the sclerodermatous lesions. It has been postulated that the porphyrins are likely a inducer of TGF beta resulting in a profibrotic milieu.